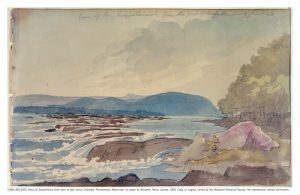 Benjamin Henry Latrobe, widely regarded as America’s first architect, played a key role in recording the early 19th century features of the Susquehanna River as it flows from Columbia to the Chesapeake Bay. 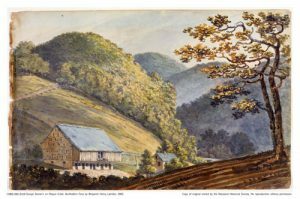 Latrobe emigrated from Britain in 1796 and began his practice in Virginia. He soon came to Philadelphia, where he completed two of his best-known works – the Bank of Pennsylvania and the Philadelphia Waterworks. Latrobe also designed the Baltimore Basilica, the White House porticos, St. John’s Episcopal Church, Decatur House, and the Washington Navy Yard main gate. He is credited with influencing Thomas Jefferson’s design for the University of Virginia. 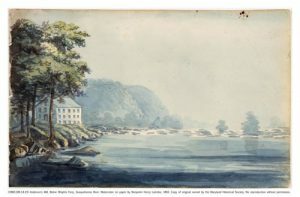 In 1801, Pennsylvania Governor Thomas McKean appointed Latrobe surveyor and assistant to his uncle, Frederick Antes, as authorized by a 1799 state statute providing for navigation improvements to the Lower Susquehanna River. Latrobe and Antes represented Pennsylvania in a joint venture with the Susquehanna Canal Company, a Maryland entity building a canal from the Pennsylvania border to tidewater. With his uncle’s death in September 1801, Latrobe assumed control of the Pennsylvania portion of the project, working with his Maryland partners. Latrobe surveyed the river in October-November 1801 with the help of two assistant surveyors, chainbearers, axemen and canoemen. He completed his map over the winter, including a proposed new route for navigating the rocky river. 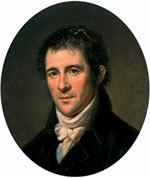 Latrobe presented his work to the governor in Lancaster (then Pennsylvania’s capital) in March 1802 and lobbied the legislature for project funding. His efforts were successful and the navigation improvements were completed in 1802. 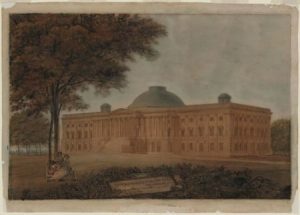 In early 1803, soon after his Susquehanna work, President Thomas Jefferson called Latrobe to Washington, DC to serve as architect of the United States Capitol. He guided the Capitol’s construction until 1811, then moved to Pittsburgh to build steamboats with Robert Fulton. Latrobe returned to Washington in 1815-1817 to oversee reconstruction of the Capitol after its burning by the British during the War of 1812. He died from yellow fever in New Orleans on September 30, 1820 while designing and constructing a waterworks system for that city. 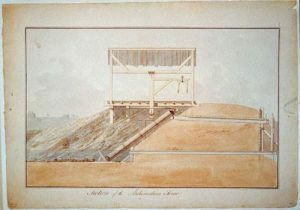 Latrobe’s original 18-foot long survey of the Susquehanna was before Congress for consideration of internal improvements when it was destroyed during the Capitol’s burning in 1814. His personal copy of the 1801 survey, shown below, now resides in the collections of the Maryland Historical Society. A full-size reproduction of this survey copy is on public display at the waterfront pavilion of the Zimmerman Center for Heritage. 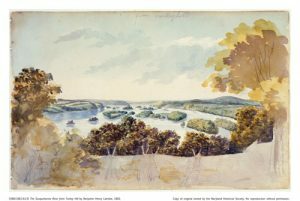 While surveying the Susquehanna, Latrobe also made pencil sketches and watercolors along his journey, capturing a scenic natural area just beginning to develop as a corridor of culture and commerce.